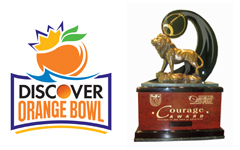 DALLAS (FWAA) – Clemson's Daniel Rodriguez is the first weekly nominee for the 2012 Discover Orange Bowl-FWAA Courage Award, to be announced at the end of the season. Rodriguez, a redshirt freshman receiver from Stafford, Va., is playing for the Tigers after earning a Purple Heart and Bronze Star in Afghanistan. "I was mesmerized by his video," Swinney told The New York Times. "I'm watching and thinking, 'Holy cow, he's amazing.'" Rodriguez enlisted in the Army after high school shortly after the unexpected death of his father, also an Army veteran. He served from 2006-10, spending 18 months in Iraq and a year in Afghanistan. He is attending Clemson on the GI Bill. The 5-8, 175-pounder has played on kickoff coverage in the Tigers' first four games, and saw action at receiver against Furman and Ball State. "You always dream of that second chance to play football again," Rodriguez said. "I'm in that position. I have that second opportunity that so many people have said, 'I wish I could get one more shot.' Well, now it is my shot. I have that opportunity."